We’ve all been there: we feel that we have an awesome connection with a client on our end but when it comes time for the follow-up appointment, the client suddenly reschedules- or worse- doesn’t show up! Over time, I’ve learned what works and what doesn’t work with keeping clients in private practice. The key in retaining clients for the long-term is to keep clients satisfied with the work you’re doing and to have open, non-judgmental communication. I don’t recommend to “keep clients happy” because as counselors, we know the counseling process is filled with ups and down. If a client was always happy, chances are it’s not realistic success. Seeing a client for the long-term is not only good for business it’s good for the client! In various fields, research always shows that more treatment leads to better outcomes. So lets remember the value of long-term relationships in addition to being business-savvy private practice owners. Here are my Top 5 tips to Keep Clients Coming Back to your Private Practice! 1. Set clear expectations up front when scheduling the appointment. Clients should know up front that the counseling process is usually over the course of at least a few months. I tell my clients that on average I see clients 6 months-1 year. This way there are no surprises! 2. Know that the counseling process is a journey. It’s filled with ups and downs and it’s impossible to make progress in a linear line. Celebrate success but also teach clients it’s normal to take 2 steps forward and then 2 steps backward. Be careful of being too much of a “cheerleader”. After all, you want clients to be honest with you when times are difficult. 3. Schedule the follow-up session at the end of the first session. This is for accountability and also to show the client that you value their progress and want to see how they are doing. I recommend to keep appointments consistent (aka “you are my Monday at 5pm client”) for many reasons. 4. Talk about open communication. If there is any tension in the room I am going to ask about it! Clients should feel like they can tell you anything- good and bad. That’s why it’s important to have a non-judgmental attitude and talk about how much you value honesty as a counselor no matter what’s going on. I also tell clients that if we’re not the right match for one another I am happy to help them find someone who is. 5. Communicate with the client’s team of professionals to reinforce your goals. 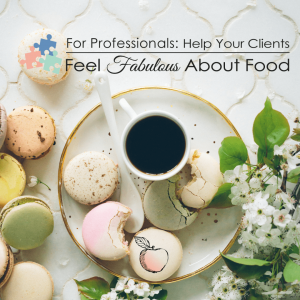 If a client has a therapist, dietitian, doctor, or personal trainer to reinforce what you’ve done in your session, chances are they are going to feel even more supported. Your role in their care is also going to be reinforced as others are going to talk about how important your work is! Talking to a client’s team is also a great way to network, as well as get more referrals.